Obviously there are HUGE SPOLERS in this review! You have been warned! And the Yuki/Haru shippers rejoiced. 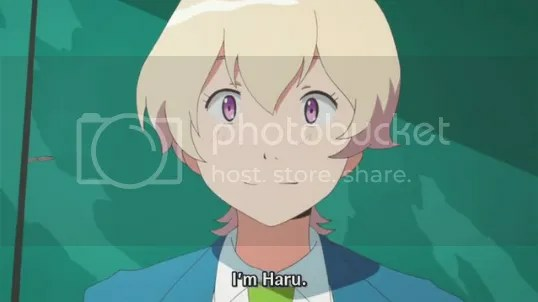 Yuki, now resolved to save Haru and his friends (and the whole world), figures out the true meaning of the legend that was written on the scroll in the Enoshima shrine. 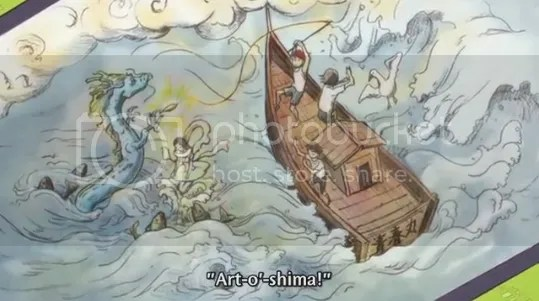 Turns out that there were actually TWO goddesses—one protected the fisherman from JFX (aka “the dragon”) while the other acted as the lure itself. 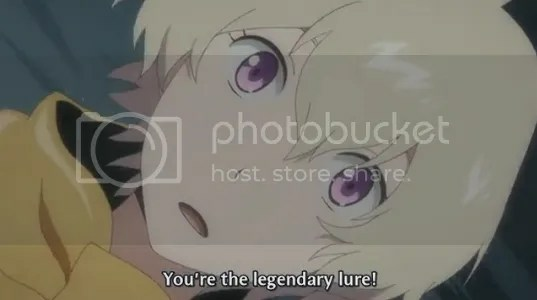 Thus, Haru is actually the lure. Akira gets word from the DUCK boss that missiles are coming their way, but both Yuki and Natsuki agree to fight till the end instead of running away. And so, after some quick preparations, Haru uses his water gun one last time to protect Yuki, Natsuki, and Akira from JFX’s spell; but it’ll only last for a little while. Then… comes the moment of truth. 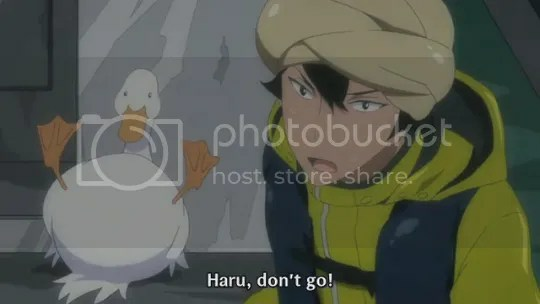 Haru was freaking adorable here. 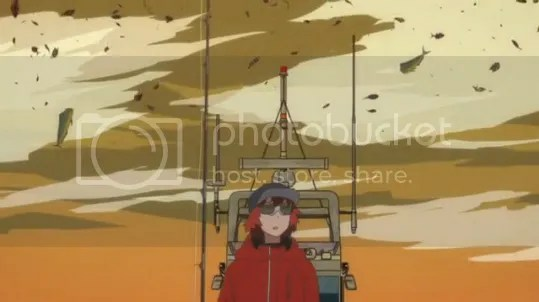 Yuki casts Haru (attached to a fishing line, with an improvised fishing hook made from Natsuki’s bracelet) into the sea. JFX is once again hooked; but this time, he remains hooked. After some ferocious struggling on Yuki’s end, Yuki is able to reel up JFX, whereupon fish descend from the skies signaling their victory. JFX turns out to be far meeker than expected, but Haru and (a revived) Coco still take him back to their planet nonetheless. The cast all say their goodbyes, and six months later, the four good friends have now all fully separated. However, Yuki finds himself to be a far happier person. His experiences have changed him—for the better. Their space-suits are so cool! A new legend is born! But of course, we can’t just end it at that, can we? Aaaaaah I loved this episode so much. So very much. It’s a really sappy, happy ending, BUT I DON’T CARE IT WAS SO HAPPY. So, so happy! To get it out of the way first, I’ll talk about the negatives of this episode. Although I liked it a lot, I did feel that some aspects of it were a bit rushed. The whole sequence after JFX’s “defeat” felt unevenly paced compared to the rest of the episode. I also think that “JFX” was let off the hook a bit too easily after almost bringing about the destruction of the world. Part of why this irks me is that I think a lot of the reason why he’s let off so easily is because he’s a pretty boy. At the same time, Tsuritama was always a happy, easy-going series so forgiving the main “villain” this easily seems to be more its style. Anyway, it’s not too big of a deal for me. Now onto the good points: I really loved the epilogue at the end of the episode! The whole episode itself was pretty epic, but what makes this episode worth watching is the very last few minutes of it. It’s pretty much one crowning moment of heartwarming right after another. AND IT’S AWESOME. Animation quality-wise, it was just a bit higher than average, I think. I think what I like most about this episode is that “goodbyes” aren’t treated as a terrible, sad thing. Because even though Haru and Coco have to go back to their home planet, everyone is still smiling as they wave the aliens off. Also, later when Yuki narrates that Natsuki and Akira have also gone their separate ways, there isn’t a hint of sadness. Instead, it’s more like happiness—happiness that his friends have moved forwards in their life. Also, it is heavily implied that the three human friends all stay closely in-touch, and that they will remain friends for a long time. Overall, a great episode! 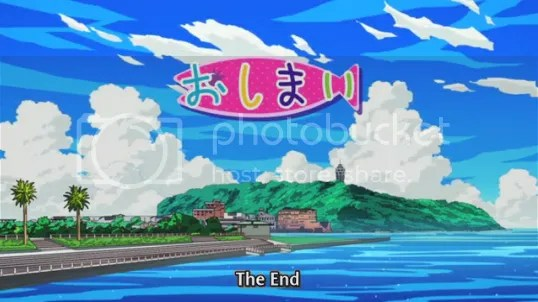 One of the more satisfying endings in anime, even if it is a bit rushed towards the end. 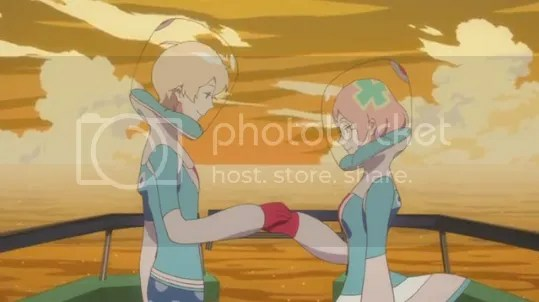 Tsuritama is certainly an interesting series. Although at first glance its premise seems to be rather mundane (a series about fishing? ), Tsuritama quickly proves that even a mundane premise can make for a good story if you have the right mix of characters and creative enough writing skills. The plot of Tsuritama, while quirky, still isn’t THAT unique in the realm of anime. However, it’s the characters that really make the series so loveable among its fans; and indeed, I believe its characterization to be one of Tsuritama’s strongest points. Although the characters that get the most focus are obviously the main four, even the minor characters get a chance to show off their unique personalities throughout the series. One of the more notable things that Tsuritama does is that it actually explores the different relationships between all the different characters—something that I think most anime tend to neglect. The pacing of the series is also one of its stronger points. None of the episodes could be considered “filler” episodes. Although some episodes are slower than others, they all served to further Yuki’s character development: from a shy, unsociable young man to a more confident and happy one. The biggest downside to Tsuritama is probably agreed on by all fans to be its animation quality. Although it is extremely lovely at times, it also veers extremely into QUALITY during some of the more action packed scenes. And it is sadly quite common throughout the series too, probably due to its water color-esque style. 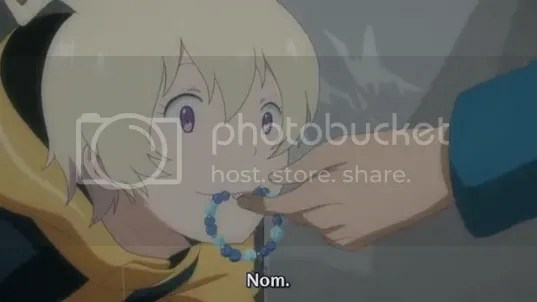 Although I would normally find such prevalent QUALITY to be a turn off in a series, I find it strangely endearing in Tsuritama. Though really, I do hope that it gets fixed in the blu-ray releases. A lot of comparisons have been made between this series and Mawaru Penguindrum. And while the two series do share quite a few similarities in terms of tone (what at first appears to be a happy series that quickly turns dark with increasing episodes), I’m glad to say that Tsuritama differs on one important point: while it does get relatively dark at times, there is always a glimmer of hope or joy. Even in terribly dark moments in the series, Tsuritama still has somewhat “comical” moments to help lighten the mood. 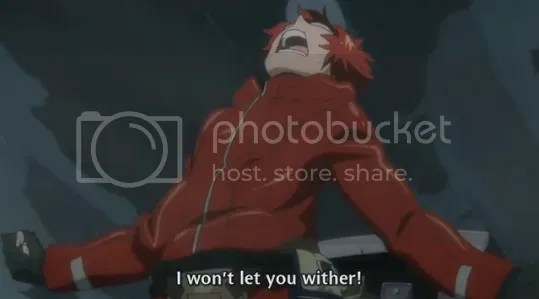 Which is another reason why I love Tsuritama so much. It’s just a really feel-good series that, while it does deal with serious issues, shows that there can be happy endings. I know that a lot of the more renowned anime are downright depressing (i.e. Madoka and others), so it’s really refreshing to have a series that ends on such a high note. To end, this is a series I would highly recommend. Maybe not to a first-timer (this would be a pretty insane series for someone’s first anime), but to any seasoned fan that wants something a bit on the happier side.